Brooklyn, NY - Police Commissioner James P. O’Neill and First Deputy Police Commissioner Benjamin Tucker joined Brooklyn Borough President Eric Adams at Borough Hall on November 16th to announce the official launch of the #MyBrooklynStory project, and website, and a public competition. With them were young people from the Brownsville, Bedford-Stuyvesant, Crown Heights, Red Hook, Ocean Hill, and Coney Island neighborhoods, all participants in #MyBrooklynStory, which has involved them in telling the stories of their respective neighborhoods through video, photos, essays, and other media. Every neighborhood has a history. Every block has a story. Working under the title of #MyBrooklynStory, young people from Brooklyn are sharing stories about their neighborhoods and how to improve them through community engagement. The students have delved deeply into the history and background of each neighborhood and its prominent figures, conducting research and interviewing their neighbors to develop their narratives. Fourteen of these stories have been mounted at MyBrooklynStory.org and will be pushed out on other social media maintained by the NYPD. The #MyBrooklynStory contest invites members of the public to join the students in submitting their Brooklyn stories. 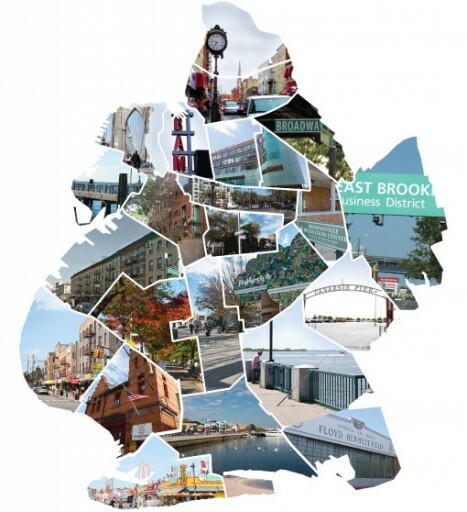 Brooklynites, young and old, can send the MyBrooklynStory.org website essays, photos, videos, or other media, telling their personal recollections about the borough. Submissions are due by February 17, 2017 and voting—open to people anywhere—closes March 3, 2017. The event at Borough Hall included a trailer that provides a glimpse of the 14 stories, as well as several short #MyBrooklynStory video pieces as told by Commissioner O’Neill, Borough President Adams, and First Deputy Commissioner Tucker, all of whom are products of Brooklyn. #MyBrooklynStory is a joint project among the young people, the New York City Police Foundation, and the NYPD, with support from the Brooklyn Borough President’s office, National Grid, the Brownsville Youth Court, and the Red Hook Community Justice Center, and the Brooklyn Nets. Going forward, in partnership with the Police Foundation, the NYPD will be taking the overarching #MyNYCstory theme to the four remaining boroughs, with the Bronx up next. My Brooklyn story... assaults, muggings, gangs, abuse... you think I'll win?